If you're considering having us perform concrete scanning for you, please have a look at these concrete scanning requirements to make sure that your site will be ready for us when we arrive. Customers must pre-mark all areas to be concrete scanned. Customers must provide access to all utility rooms. Areas must be cleared of debris and any equipment that can be moved. Areas must be marked in yellow. We recommend Markal Paintstik. Lines must be a minimum of 4" long. 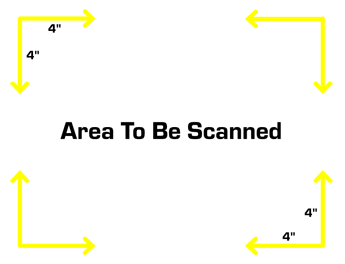 If the scan area is larger than 20' there must be yellow lines in between so that we can locate the area. Tolerance zones shall be determined by the customer – we can make recommendations. We will use a permanent paint marker to mark out each area. Colors will match our color code (shown above) for marking out underground utilities. By making sure that we have everything we need ready to go when we arrive, you can be sure that our scanning will be quick and efficient. Thanks!